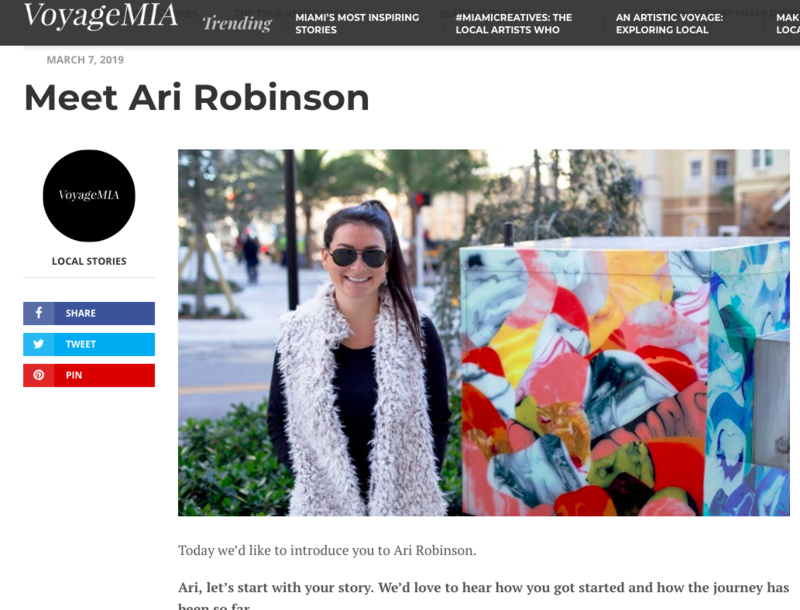 Today we’d like to introduce you to Ari Robinson. Ari, let’s start with your story. We’d love to hear how you got started and how the journey has been so far. Throughout my life, I have always been a creative person and had an interest in the arts. It really was not until after high school where I found my true passion for making artwork. I had always succeeded in artistic fields but after my first semester of college, I realized that I wanted to focus more of my time and energy on what I love to do and switch my major to Studio Art. I figured if I’m paying all of this money to go to school I mine as well enjoy what I’m doing in class right?! Since graduating from college in 2015, my art career has been on a steady and growing path to where I now have a consistent and recognizable body of work. I would say that it has been a pretty smooth road so far. Of course every now and then I have struggles and become my own worst inner critic like most artists, but I try to do something every day to push me one step closer to my goals. The harder you work the luckier you get! Please tell us about Ari Robinson Art. My artwork mainly consists of collages and installation sculpture. I would say when people describe my work; the first thing that comes to mind is COLOR! Color is a very important component in my works as I believe it has the ability to evoke feelings of something transcendent or suggest a transcendent space. I want people to be happy while viewing my work. If I had to pick something I am most proud of as an artist, I would say that I’m proud of myself for continuing to push to be better every day as an artist and as a business. This is an easy field to feel rejection and have it stop you in your tracks but I think pushing through it has been critical for me and if I had let something small stop me before I would have never met all of the amazing people I have in the art community. Is there anyone, in particular, you would like to recognize? Mentors, etc? There are almost too many people to name that I could thank during my career as an artist thus far. I had the best experience in college with very encouraging and talented professors as well as the privilege of having mentors to discuss the business side of art. Most importantly, my family has had such a big role in the support that I have received. Without support from them, I’m not sure I would be where I am today. I also would like to thank anyone who has supported me as an artist by purchasing artwork from me. It’s what keeps me going and what gives me the opportunity to do what I love and create more work!